(CNN) - Does the road to the White House run through the Rocky Mountains? A new state poll in Colorado suggests that Barack Obama has doubled his lead over John McCain there, as the Democratic nominee claims more territory on CNN’s Electoral Map. In a new survey — one of five new CNN/Time/Opinion Research Corporation state polls released Wednesday - 53 percent of likely Colorado voters questioned say that Obama is their choice for president, with 45 percent backing McCain. That 8 point lead for Obama is double the 4 point advantage he held in our last poll, taken two weeks ago. "Older voters in Colorado have started to break Obama's way." CNN Polling Director Keating Holland said. "Two weeks ago he was losing the over-50 crowd by a couple of points. Now he has a five-point edge among them." The new numbers in Colorado, along with similar findings from other new polls in the state, are factors in CNN's move of Colorado from a toss up state to lean Obama in our new Electoral College Map. CNN is also changing Indiana from lean McCain to toss up. A new CNN Poll of Polls in Indiana suggests McCain holds a two point lead over Obama in a state that hasn't voted for a Democrat in a presidential election since 1964. The poll of polls is an average of the latest state surveys. With the switch of Colorado’s nine electoral votes and Indiana’s 11, CNN now estimates that if the election were held today Obama would win states with 286 electoral votes and McCain states with 163, with 89 electoral votes still up for grabs. Two-hundred and seventy electoral votes are needed to clinch the presidency. 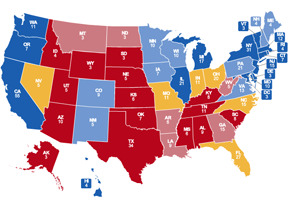 Obama's estimate of 286 electoral votes is a jump from 274 in our most recent electoral college map. Washington State is also being moved from lean Obama to safe Obama, though that move doesn't change the electoral count. The CNN Electoral College map is an estimate of what could occur if the election were held today. State polls, voting trends, campaign visits and advertising, are among the factors used in deciding the electoral college map. Colorado is one of three western states that voted for George W. Bush four years where Obama now leads McCain. The others are Nevada and New Mexico. Democrats have been making major gains across the west at the state level the past two election cycles, and the party held its nominating convention in Denver this summer as part of a strategy to win over the region in the race for the White House. CNN Senior Political Analyst Bill Schneider says that Obama's widening lead in Colorado is being "propelled by an amazing 15-point Democratic lead in Colorado's fast-growing suburbs. The nation's economy has faltered, and so has Republican support, for nearly 30 years the cornerstone of the Reagan coalition." A CNN/Time/ORC poll released Wednesday also suggests that Obama is holding on to a strong lead in Virginia, with 53 percent of those questioned backing Obama and 44 percent supporting McCain. That 9 point lead is down from a 10 point lead Obama held in our last poll conducted in Virginia last week. No Democrat has won Virginia in a presidential contest since Lyndon Johnson carried the state in 1964. Both McCain and Obama, campaigning in Florida Wednesday, are fighting hard to win the state's 27 electoral votes. The CNN/Time/ORC poll indicates that Obama holds a small 4 point edge there, 51 percent to 47 percent. George W. Bush carried Florida by 5 points as he won re-election as president in 2004. Bush also won Georgia by 17 points over Sen. John Kerry, the Democratic presidential nominee, in that election. But the CNN/Time/ORC poll suggests McCain holds a much smaller lead over Obama this time around. Fifty-two percent of likely Georgia voters are backing McCain, with 47 percent supporting Obama. That 5 point lead for McCain is down from an 8 point lead McCain held in our last poll, conducted two weeks ago. And the CNN/Time/ORC poll indicates that Missouri, another state George Bush carried in 2004, is basically a dead heat. McCain holds a 2 point lead in the poll, 50 percent to 48 percent, well within in the survey's sampling error of plus or minus 3.5 percentage points. The poll was also expanded to include the major third party candidates, Independent Ralph Nader, Libertarian candidate Bob Barr, and Green Party candidate Cynthia McKinney. None of them are polling over 4 percent in any of the states surveyed, and none of them seem to be a factor in the outcome of the results in those five states other than Missouri, where Nader's 4 percent showing could have an impact. But will he hurt either McCain or Obama? "In most of the states we have polled in, the margin between Obama and McCain is the same in the two-way match-up as it is when we include the minor-party candidates," Holland said. "That indicates that Barr, Nader and McKinney together may be drawing equally from boththe Democratic and Republican candidates." The CNN/Time/Opinion Research Corporation polls were conducted Thursday through Tuesday, with 774 likely voters in Colorado, 747 likely voters in Florida, 690 likely voters in Georgia, 825 likely voter in Missouri, and 721 likely voters in Virginia questioned by telephone. I apologize to the rest of you for George Bush. I have never voted for him for President but I have for gov. of Texas. He should have never left Texas. I said that 8 years ago and still stand by it. Can't go on with more of the same for 4 more years. I am now retired and work as a volunteer everyday for democrats–local, state of course national–every day! A change is coming, I feel it in the atmosphere!!!! Weaping may indur for a night but joy comes in the morning. So what, if 100,000 show up at an Obama rally, doesn't mean they will all vote, or that they are pro Obama! I attend many sporting events and many concerts with thousands of people, though I'm not paying $100 for a denim jacket with their logo. Obamas numbers are soooooo inflated!!! Yeah! In one week we will know how the electoral map will flesh out. Let's hope that all voters have a chance to speak! COLORADO may mean red in Spanish but it's going blue this time around. People are wising up! After listening to the last debate and how Mr. O fluttered, I have to change my vote to McCain. It is evident of the support Obama has garnered by the intellectual level of his backers. The polls are all wrong, and McCain will win! NEW PRESIDENT OR BUSH SUCCESOR? By the way, Pennsylvania (which hasn't voted for a Republican for Pres. since 1988) is gonna be a loser for McCain as well. The closest any poll has him at, six days out, is the Rasmussen poll at 7 points, while the average of PA polls has him down double digits at 11 points. Even if McCain gets it closes the gap, the city votes from Philly and Pittsburgh will put Obama over the top, just like they did for Kerry in '04 and Gore in '00. McCain is wasting time and money in PA, which is costing him in places like Ohio, Florida and Virginia. Vote for Obama and vote early! He's brilliant and inspirational and has his heart and head in the right place for these times. We can't afford to have four more years of the disastrous, worn-out Bush-McCain Republican policies and their discredited, unilateral, cowboy-style, pre- emptive international aggression. And please, don't allow Sarah Palin to be a heart beat away from being Commander in Chief of the United States... Talk about a dangerous recipe for disaster!